Do not save wild animals from wildfires. Sure, the video is cute. It’s also a terrible precedent, please stop sharing it. Have you seen the viral video of the man who reportedly pulled onto the side of Highway 1, near La Conchita, California, to save a rabbit from the devastating Thomas fire? The hero in a hoodie put his own life at risk to save a widdle wabbit from the big fire. The common response to this has been that his actions should renew our faith in humanity. 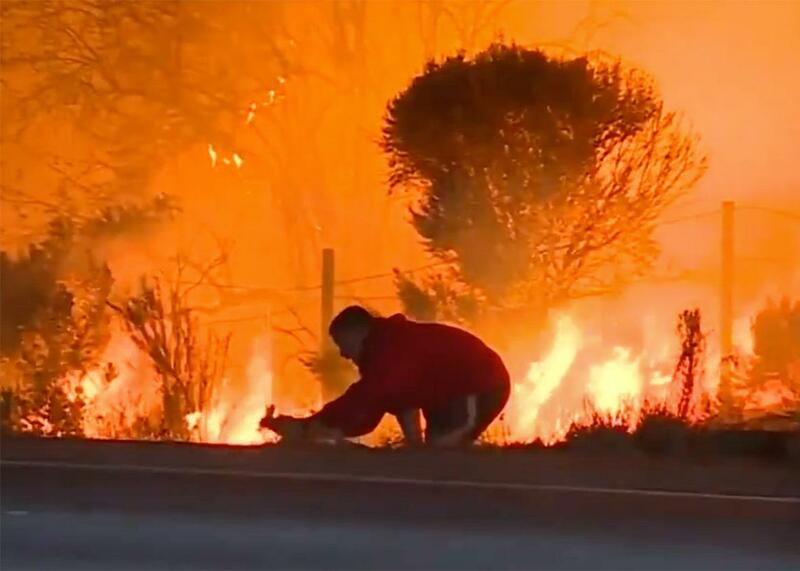 “Emotional Man Becomes Viral Hero When He Rescues Rabbit From California Wildfires,” crows a People headline. In these dark times, I understand the tendency to turn to cute animals and stories of acts of kindness for pick-me-ups. But trying to save wild animals from a fire is a stupid thing to do. We should not reward this behavior, and we should not encourage others to do the same. Shortly before 2 a.m., flames rolled down the hillside just off the 101 Freeway, near Faria Beach Park, before jumping northbound lanes and igniting weeds in the center divider. Drivers swerved to avoid the flickering flames, with smoke making it hard to see farther than a few feet at times. Visibility problems triggered a full shutdown of the freeway, according to the California Highway Patrol’s online incident log. Authorities said they’d been to the neighborhood—where there’s only one way in and one way out—twice ordering people to leave, telling them it was too dangerous to stay. According to KABC, the video was captured by a news photographer Wednesday night. “The man, who did not want to be interviewed, pulled over and was panicking as the rabbit he chased hopped right near large flames,” KABC reported. We see him jumping around in the clip, wearing a hoodie and shorts, as cars drive by. He gets closer to the rabbit, backs away from the flames, and then finally scoops it up and pulls it into his chest. “He’s saving an animal,” someone says off-screen, awestruck. We don’t know what happened to this man before or after his rabbit rescue. He may have been in shock, or he may have been traumatized. I certainly have no idea how I would react if I were within spitting distance of a wildfire and spotted a cute animal. (OK, I have a small idea: I probably would not have tried to save it, because I harbor an intense fear that I will forget to stop, drop, and roll if the need ever actually arises.) Either way, I don’t blame the man in the video. The biggest problem with this video is not the story of this individual man and this individual rabbit, though. It’s that our bizarre fetishizing of animals on the internet could prompt others to attempt the same—to stop in the middle of an evacuation to save an animal. That puts not only the would-be rescuers at risk, but also firefighters—who have more important things to do—and other evacuees. That prospect should make us all hopping mad. Is there anything you can do to help animals fleeing wildfires? A widely circulated meme says that people on the fringes of fire should leave water outside (and bring pets indoors) in case animals need to stop to quench their thirst. But even that might be ill-advised: In October, California Fish and Wildlife spokesperson Peter Tira told SFGate not to bother. Tira says wild animals, like deer, foxes, coyotes and other creatures likely affected by the Wine Country fires, have the ability to adapt and survive, and leaving buckets of water out for them is not only unnecessary, but unadvisable. “Fire is something animals have to deal with constantly,” said Tira. And increasingly, so do humans. So let the animals take care of themselves. Even in the video, that’s what the rabbit is trying to do: run out from the flames.